Francesc "Cesc" Fàbregas Soler (IPA: ['sɛsk 'faβɾəɣəs su'ɫeʁ̞]) (born May 4, 1987 in Arenys de Mar, Catalonia, Spain) is a Spanish footballer who plays as a central midfielder for Arsenal in the English Premier League and for the Spanish national team. Fàbregas started his career as a trainee with FC Barcelona but was signed by Arsenal in mid-2003. He did not feature much in his first season for the Gunners, but following injuries to key midfielders in the 2004-05 season, he became utilised more often and gradually established himself as Arsenal's starting central midfielder alongside Gilberto Silva. Fàbregas started playing his club football at FC Barcelona. During his youth career, he was played mostly as a volante (defensive midfielder), yet he was also a prolific scorer, sometimes scoring more than 30 goals in a season. However, he did not play a first-team game at the Camp Nou. Sensing that he would have limited opportunites at Barcelona if he stayed, he decided to join Arsenal, signing for the London club on 11 September 2003. Initially, he found life difficult in England's capital but soon struck a friendship with team-mate Philippe Senderos, who helped him settle down. As a 16-year-old, Fàbregas did not even think about breaking into the first team but looked up to his seniors Patrick Vieira and Gilberto Silva, while concentrating on training and learning the English language. He made his début not long after, on October 23, 2003, in a League Cup tie at home to Rotherham United. In doing so he became Arsenal's youngest-ever first-team player, aged 16 years and 177 days. He then became the youngest goalscorer in Arsenal's history in a later round of the League Cup, scoring from close range in a 5–1 victory against Wolves. Although Arsenal went on to win the league unbeaten in the 2003-04 season, Fàbregas was not given a winner's medal because he did not play in a single league game. Fàbregas takes a shot at goal in a game against Sheffield United in 2006.It was not until the start of the 2004–05 season that the Spaniard started making first-team appearances in matches outside the League Cup. His first match of the season was against Manchester United in the Community Shield. Following an injury to Vieira, Fàbregas stepped in and made four consecutive Premier League starts. He earned praise for his performances in those games, even claiming a goal against Blackburn Rovers in a 3–0 victory, and becoming Arsenal's youngest ever goalscorer in a league game. With further injuries to Edu and Gilberto Silva, more playing time in all competitions was extended to the teenager. In the UEFA Champions League, he became the second-youngest goalscorer in the competition's history after scoring the third goal against Rosenborg in a 5–1 victory. He concluded his season by winning his first honours with Arsenal when he was in the starting eleven that defeated Manchester United on penalties in the 2005 FA Cup Final. 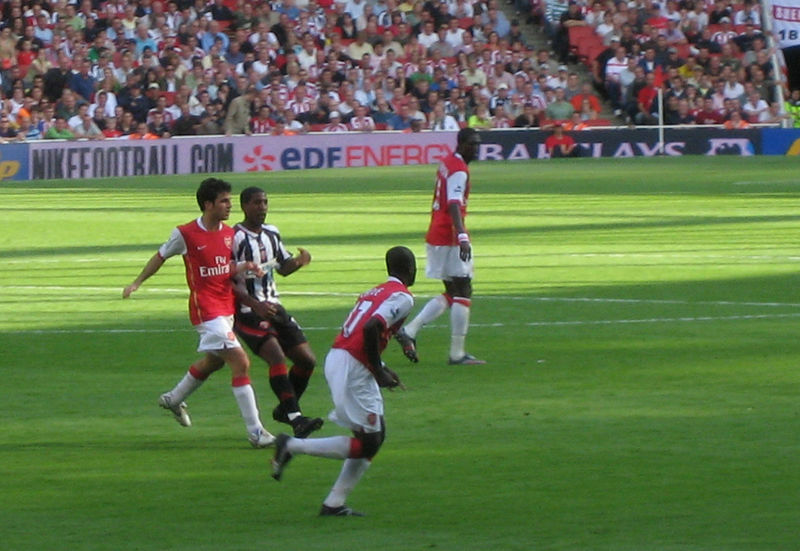 After the departure of Arsenal captain Patrick Vieira to Juventus, Fàbregas featured regularly in the Arsenal central midfield alongside Gilberto Silva. Inheriting the number 4 jersey from Vieira, he made 49 appearances in all competitions during the 2005–06 season. Despite his young age, given that he was establishing himself as a regular in the side, his performances came under greater scrutiny. Possessing a smaller frame and playing with less aggression than Vieira, there were initially doubts over his ability to fill in the void left by the Frenchman. Nevertheless, Fàbregas asserted his own style of play and impressed pundits in the Champions League against Real Madrid and Juventus. In the latter, he scored Arsenal's first goal and set up Thierry Henry for the second, at the same time proving that he could hold his own against tough, hard-tackling midfielders like Vieira. He then played in the final against his former club Barcelona, but Arsenal were defeated 1–2, completing a trophyless 2005-06 campaign for Arsenal. 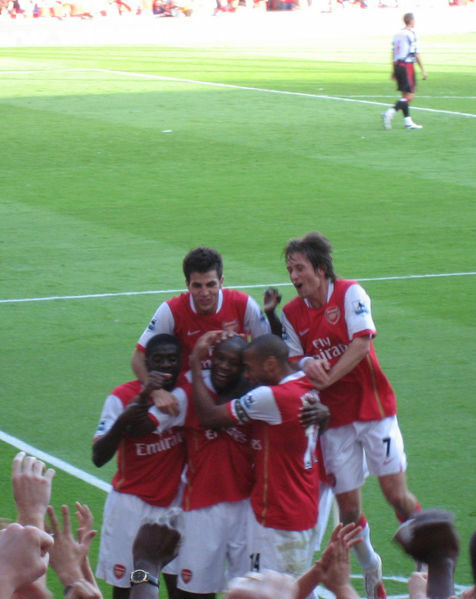 Fàbregas celebrates a goal with his Arsenal team-mates.Fàbregas' increase in stature drew transfer speculation during the summer; Real Madrid expressed a desire to sign the Spaniard despite his long-term contract with Arsenal, but Arsenal manager Arsène Wenger stated that Arsenal would not listen to any offers. In September 2006, with six years left on his deal, Arsenal offered a new eight-year deal to the midfielder, which he signed on October 19, 2006. While the contract was unusually long, Fàbregas cited Arsenal's playing style and Wenger as reasons for his long-term commitment to the club. 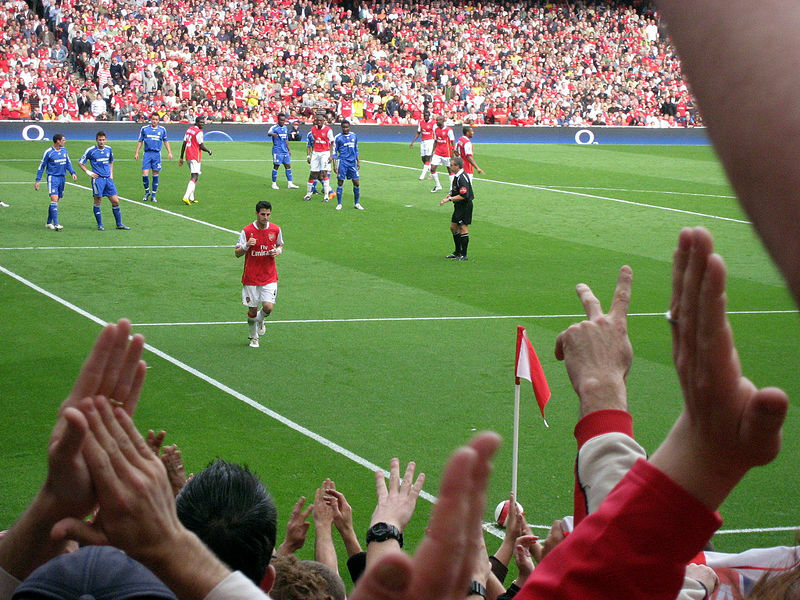 The 2006-07 season proved to be another learning experience for the young Arsenal squad and Fàbregas. The club again failed to secure any major honours and was defeated by city rivals Chelsea in the League Cup final. However, Fàbregas emerged as one of the key creative players for the team, playing in every single league game. He kickstarted Arsenal's UEFA Champions League 2006-07 campaign when he scored a brace in a 3–0 win over Dinamo Zagreb in a qualifier match. In the Premier League, he notched up 13 assists (second-highest in the league). He ended the season with several individual honours, including the Golden Boy award, presented by the Italian paper TuttoSport, based on a poll of leading writers across Europe. He was also named in the 2006 UEFA Team of the Year, and named FA Premier League Player of the Month for January 2007. Additionally, he was nominated for both PFA Players' Player of the Year and PFA Young Player of the Year, but both awards went to Manchester United's Cristiano Ronaldo. Although he is now featuring regularly for the Spain national football team, Fàbregas' international career had already begun at the youth level. At the 2003 FIFA U-17 World Championship held in Finland, he finished as top scorer of the tournament despite playing in midfield, and was voted Player of the Tournament. Spain finished runners-up in the tournament to Brazil. After emerging as one of Arsenal's key players in only his second season at the club, it did not take long for Fàbregas to be called up to the senior squad. Noting his impressive performances in Arsenal's 2006 Champions League campaign, Spain coach Luis Aragones named the teenager in the team for a friendly against the Ivory Coast. In that game, Fàbregas became the youngest player capped for Spain in 70 years. He received good reviews for his début, and was involved in the build-up to Spain's first goal in the 3–2 victory over the Ivorians. Fàbregas runs up to take a corner kick.Originally brought to Arsenal as a youth to slowly develop via the League Cup, Fàbregas was unexpectedly deployed as Arsenal's starting central midfielder following injuries to fellow midfielders Patrick Vieira, Gilberto Silva and Edu during the 2004-05 season. Fàbregas functions mostly as a playmaker and his main asset is his passing range. As one of the most coveted young talents in the game today, he is a vital part of Arsenal's first team, bringing vision, creativity and selflessness to Arsenal's intricate passing game, and displaying maturity that belies his age.In set pieces, he is one of the first-choice corner kick-takers in the team.